If you are ready to jump in and install a new dedicated home theater in your Irvine, California home, it’s not as easy as just picking a room and putting in a screen and some speakers. One of the areas most people go wrong is not paying attention to the acoustics in the room. 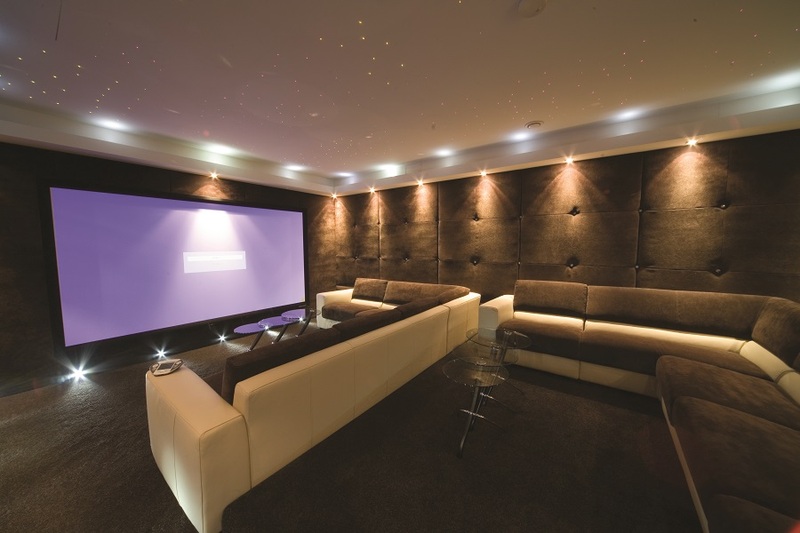 Your basement or extra bedroom may seem like the perfect place to put your private cinema, but is it filled with hard surfaces? Are the walls so thin that the sound leaks out? Read this blog to learn about three ways we can improve the acoustics in a home theater. Have you ever been in a large room with tile flooring and walls? Each step you take echoes, and the sound bounces creating noise that reverberates throughout the building. If your dedicated theater is filled with hard surfaces, this will happen. To prevent reverb and ensure that the sound is crystal clear, add acoustic panels to the walls and ceiling. Essentially, these thick panels help absorb and cushion the sound so that it doesn’t bounce off the walls and create feedback. You may think, well do these panels look ok? We actually partner with some brands that have acoustic panels that look like artwork so that people won’t even notice they are a part of the audio equipment. You can trust our team to arrange them in a way that looks fashionable, or simply blends into the décor. Acoustic panels help improve the way you hear the sound in the room, so that your system is accurate and performs at its best. Sound proofing relates to preventing the sound from leaking out of the room into the rest of your home and outside. We’re sure you don’t want to disturb your neighbors or the rest of your family while you are enjoying a movie. Unfortunately, typical walls aren’t made to block noise. Since they are made up of drywall and wood, the sound can easily go through the materials to the other side. To prevent this, we add sound-blocking doors and other padded materials to keep the sound inside the room. 3. Carpet, chairs and more. Another strategy is installing carpet and motorized drapes in the room. All of these items contribute to both sound-proofing and proper acoustics. Even the chairs you place in the room can help improve the sound. Pick chairs that are made of cotton or polyester instead of leather. Of course the best part of having a home theater is using the controls. Once it is all said and done, you can open an app on your tablet, phone, or custom touchpad and close the drapes, adjust the volume and select your show. You won’t have to worry about playing the sound too loud and you can relax knowing your home theater is going to sound amazing. To add acoustic treatments, custom home theater controls and more to your Bel Air home, fill out this online form and we’ll set up a meeting with you. Questions? We have the answers and personnel to help you with any problem! For additional details, appointments, receiving quotes or anything else, contact us today! "You and your Audio Images team have far surpassed our expectations for our audio vision needs in the building of our new home. It is so refreshing to work with such talented, honest, conscientious people. You have all of the cutting edge technology information, and you have explained the options very well. You have smoothly worked with designers, contractors and carpenters, and the results are great."